Joan of Acre, Rebel Princess – History… the interesting bits! Joan of Acre had an exotic start in life; she was born in Palestine, whilst her parents were on the 9th Crusade, in the spring of 1272. Joan’s parents, Prince Edward of England and Eleanor of Castile, had arrived in Palestine in May 1271. The Crusade had very little success and the nominal King of Jerusalem, Hugh III of Cyprus, brought it to an end by signing a 10 year truce with Baibars, the Mamluk leader, in May 1272. Eleanor having just recently been delivered of her daughter, Joan, and an assassin’s attack that nearly cost Edward his life, forced the couple to stay in the Holy Land a while longer. But in September Edward and Eleanor set sail for Europe , bringing their baby daughter home. They stopped in Sicily on their way, before spending Christmas on the Italian mainland. It was while in Italy that English messengers arrived with the news that Henry III had died in November – and Edward was now king. The news did not hasten Edward’s return to England; he and Eleanor continued their progress through Europe, visiting Eleanor’s mother Joan, Countess of Ponthieu, in France. They left little Joan at Ponthieu, to be raised by her grandmother for the next few years. Edward and Eleanor went on to England, arriving there in 1274, and Edward’s coronation. By the time Joan finally arrived in England, in 1278, her father was in the process of arranging a marriage for her; to Hartman, son of the King of the Romans, but he died before the wedding could take place. Towards the end of the 1270s Joan, along with her elder sister Eleanor and her younger brother Alfonso, were allowed to accompany the royal court, for parts of the year at least. They would have been allowed to take part in the Christmas and Easter celebrations with their parents, whilst their younger siblings remained in the royal nursery. Little is known of Joan’s every day life. She may have been close to her baby brother, Edward – the future Edward II – as she lent him the use her own seal when he was at odds with his father. It is said that she was distant from her parents; however this stems from their leaving Joan with her grandmother during her early years and doesn’t necessarily mean the same relationship continued when she finally arrived in England. Edward and Eleanor traveled relentlessly, and not always with their children. Nevertheless, they did make time for their family, with weeks at Leeds Castle and Windsor built into their itinerary. What is certain is that Edward planned for the future of the children through their marriages. Following the death of Joan’s first intended, Hartman, Edward started looking for an alternative husband. He finally settled on Gilbert de Clare, 8th Earl of Gloucester and 7th Earl of Hertford, also known as Gilbert the Red. Gilbert had been married to Alice de Lusignan, half-sister of Henry III, in 1253 when Gilbert was 10 years old. The marriage was finally annulled in 1285. 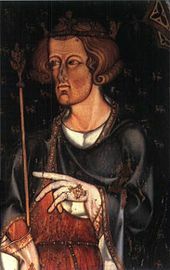 One of the most powerful barons in England, offering Joan in marriage was intended to bind Gilbert to the royal cause, thus weakening baronial opposition. As part of the agreement, Gilbert relinquished his titles to the crown and regained them on his marriage to Joan. 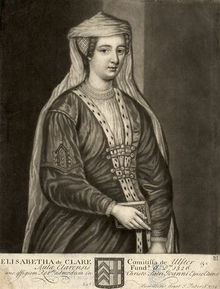 Joan and Gilbert were married in a private ceremony at Westminster on 30 April, 1290. Joan was 18 years old, Gilbert 46. Later in the same year, at the celebrations of the wedding of Joan’s sister Margaret – to John II, Duke of Brabant – Gilbert and Joan, along with many members of the court, took the cross. Although they planned to go on Crusade, events in Scotland changed Edward’s priorities, and the Crusade never happened. Joan and Gilbert were married for 5 years; Gilbert died at Monmouth Castle on 7th December 1295. They had a son and 3 daughters together. Their son, also called Gilbert, succeeded his father as Earl of Gloucester and Hertford, was killed at the Battle of Bannockburn in 1314; he was married to Matilda, daughter of Richard de Burgh, Earl of Ulster, and sister of Elizabeth de Burgh, Robert the Bruce’s queen. Of their daughters, Eleanor would first be married to Hugh le Despenser, the Younger, the favourite of he uncle Edward II who was executed in 1326, she then married William la Zouche de Mortimer and died in 1337. Margaret was married to her uncle, Edward II’s first favourite, Piers Gaveston, Earl of Cornwall, who was executed in 1312; she went on to marry Hugh Audley and died in 1347. Their sister, Elizabeth, married 3 times; John de Burgh, Theobald de Verdon and Roger Baron d’Amory. Joan was widowed in 1295 and Edward wasted no time finding suitable new husband; Amadeus V, Count of Savoy. However, it seems Joan had other ideas. In January 1297, in one of the few genuine love matches of medieval history, she secretly married Ralph de Monthermer, her late husband’s squire. Before the marriage took place, Joan had sent Ralph to her father, requesting that he be knighted; she married him shortly after his return. The marriage angered Edward so much he is said to have thrown the crown, he was wearing, into the fire. He ordered Ralph’s imprisonment in Bristol Castle, refused to receive Joan and confiscated all the lands and castle she had inherited from her late husband. Joan is said to have sent her 3 daughters by Gilbert to their grandfather, to try to appease him, and the Bishop of Durham also attempted to mediate. It seems likely that Edward mellowed when he saw Joan was pregnant with Ralph’s child – which may also explain the hasty, secret wedding. Monthermer was released and summoned to the August 1297 parliament as Earl of Gloucester and Hertford, by right of his wife. Joan and Ralph seem to have had a happy, loving relationship. They had 2 sons and 2 daughters. Their eldest son, Thomas, was killed at the Battle of Sluys in 1340 and their second son, Edward, died in the same year. Of their 2 daughters Mary married Duncan the 10th Earl of Fife, while Joan became a nun at Amesbury Abbey in Wiltshire. After just over 10 years of marriage with Ralph, Joan of Acre died at Clare in Suffolk on 23rd April 1307, from an unknown ailment, aged just 35. 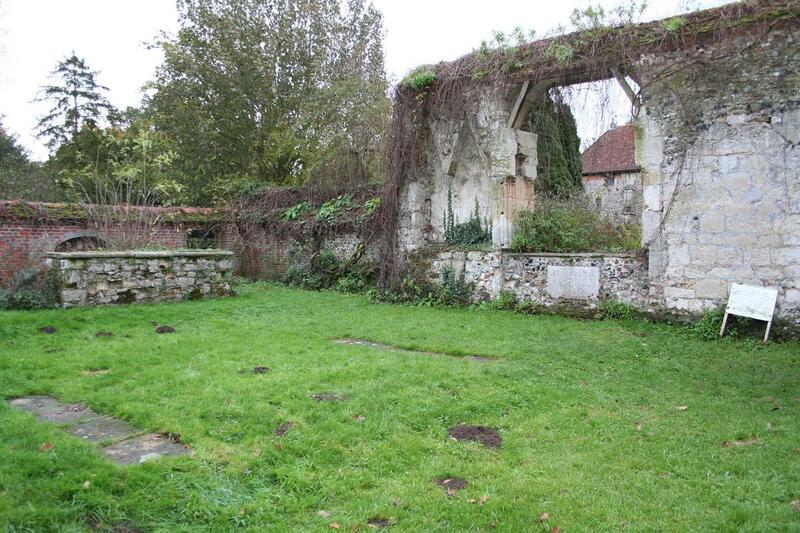 She was buried in the Augustinian Priory there. The Earldoms of Gloucester and Hertford passed to her son by Gilbert. As her widower, Ralph was given the title 1st Baron Monthermer. Sources: Edward I A Great and Terrible King by Marc Morris; Brewer’s British Royalty by David Williamson; Britain’s Royal Families by Alison Weir; The Mammoth Book of British Kings & Queens by Mike Ashley; The Plantagenets, The Kings Who Made England by Dan Jones; findagrave.com; susanhigginbotham.com; womenshistory.about.com. Joan “of Acre” Plantagenet is my 20th GGM. Again, I love your stories about my ancestors. Thank you for your well-written piece on my ancestor, Joan of Acre, though my Clopton ancestry….Love the visit the Long Melford, Suffolk, where our John Clopton restored Holy Trinity Church in around 1474, and it’s a magnificent Wool Church….Princess Joan of Acre is buried in Clare, only miles away from Long Melford, and our Clopton Reunion group may visit the Priory in Clare, when we assemble in 2020…Besides Texas, my favorite part of the world..